One more post from Cuba before I forget! Ever been to an organic farm that’s also an art gallery and pottery production centre? Well neither had I until this lovely little trip. This family run farm in the Cuban region of Jovellanos is home to it’s owners who have recently opened it up for tourist visits. The farm is also host to annual art galleries and events that attracts exhibitors from all around the globe. All produce is organically grown, they make their own bricks, and pottery items, the eco-friendly lifestyle here is a great benchmark of an organic, holistic lifestyle. Each year the family have to give a portion of everything the produce to the Cuban government. There is a deep peacefulness on the farm, relaxing and tranquil as peacocks and chickens roam around going about their leisurely business. There are countless varieties of trees, plants, flowers and crops which the family tend to with a little help from their friend Sindy, who helped to host our group during the visit. On arrival, we took our seats and enjoyed the most delicious sweet herbal/fruit tea, piping hot in cute little farm made cups. The tea had a mix of ingredients including lemon and honey, I can’t remember the rest but it was ‘just’ divine! We were all offered the opportunity to sit and have a go at the pottery wheel, but no one wanted to get their hands dirty!! the flower on the mango trees….. This tractor is still proudly going strong today – and has been since the 1600s. We stuck our fingers in a beehive! That’s right, I kid you not. My most daring action of my entire Cuba trip lol. It may surprise you to hear that there are breeds of bees that do not sting, and we had the pleasure of meeting some of these at the farm and getting a taste of their honey straight from the hive with our own fingers!! The taste of the honey was like nothing I’ve tasted from any shop, I can only describe it as deliciously organic! 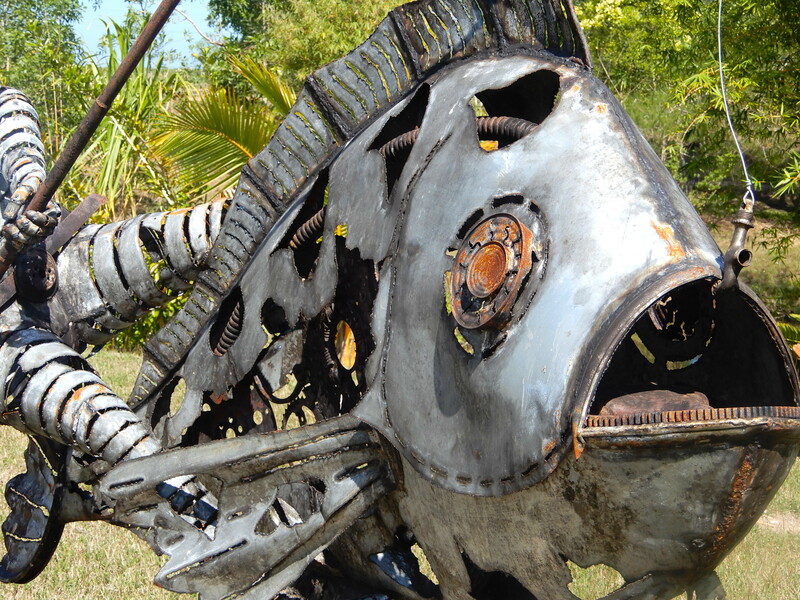 There was something a bit fishy about this piece…. Mine was a Papaya, banana, and mango juice – no words, just so good! Lunch was a generous wholesome spread. The family don’t live in this house, but they have preserved it as a impressive museum piece. Left: our tour guide for the day Middle: Héctor Correa’s wife Right: Sindy, who also hosted on the farm. Th hairiest tree I ever did see!! We looked at various interments used for salsa, rumba and cha cha cha percussion music, having a go on each one. Fantastic. Quite a journey. Muchas gracias. You are right, it was a long post, I have crammed quite a bit into this one – but I felt like I’d probably end up with too many and wanted to get off the subject of Cuba!! Hopefully anyone who is specifically interested in Cuba will find it useful. Have a lovely weekend!